With summer right around the corner, most Minnesotans are in full lawn-maintenance mode. The hiss of sprinkler systems is starting to join the chorus of morning birds, and the roar of lawn mowers disrupts the tranquility of fresh spring afternoons. Many people are spending hours out in their yards, not yet enjoying the spaces, but preparing them to be beautiful in the coming months. While yard work might be an enjoyable pastime for many people (myself included), it’s not as enjoyable to take a closer look into the resources required to maintain a green and glorious yard. The yard may look lush and green, but your wallet, your free time, and the environment are paying the price. This high cost of maintaining an ideal lawn is leading many people to consider a “greener” option: sustainable landscaping. Sustainability can mean many different things for different people. Jeff Zaayer, a landscape designer at Southview Design, says, “Generally, people think sustainable is something that’s going to last and thrive as much as it can with minimal inputs.” Typical inputs for landscaping would include water, fertilizer, maintenance, and people’s time. By using plants and materials requiring minimal inputs, sustainably designed yards also have a positive environmental impact. There are many environmental benefits to sustainable landscaping choices, but the most considerable resource preserved is water. Zaayer notes that most people don’t realize how much water actually goes in to making yards look green. “For a typical Minneapolis city lawn, an in-ground irrigation system is going to kick out anywhere between 1,000 and 2,000 gallons of water every time it cycles.” Additionally, many people run their systems even when additional watering isn’t needed, which greatly increases the amount of water used. Sustainable options seek to avoid this water consumption, lessening the impact on both the wallet and the environment. 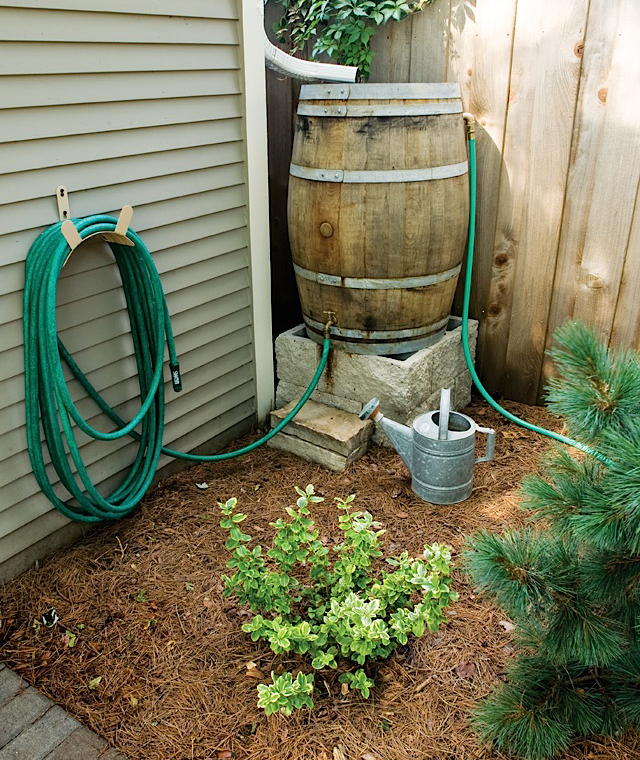 By capturing and using rainwater through the use of rain barrels, homeowners can water the areas that need extra moisture. Also, the use of rain barrels and rain gardens reduces the burden on the city storm sewers, which can quickly get flooded during a heavy storm. In addition to saving water, sustainable planting choices can also limit the amount of gasoline used for frequent mowings and reduce the amount of organic waste created. Rain Barrel, Both in form and function. 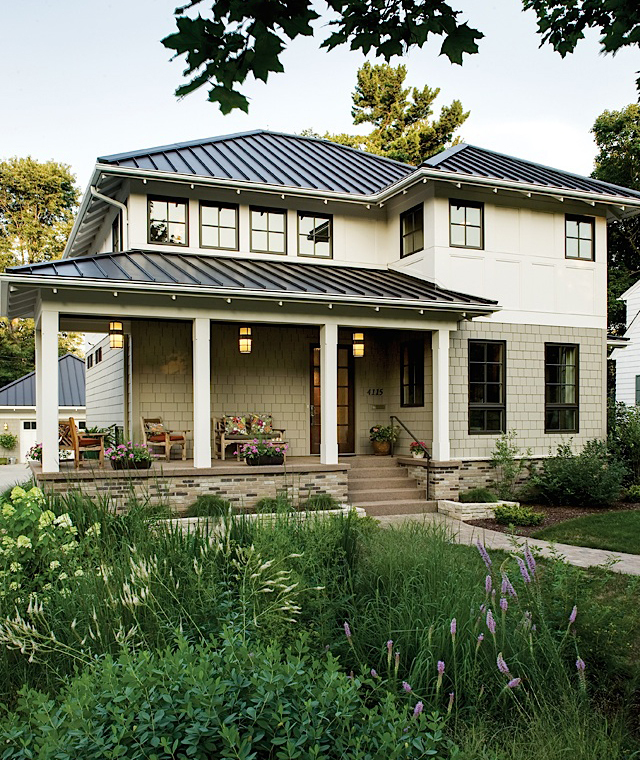 Zaayer recently joined me at my new home in the Victory neighborhood of Minneapolis to talk about the sustainable landscaping choices he helped the previous owner bring to fruition. 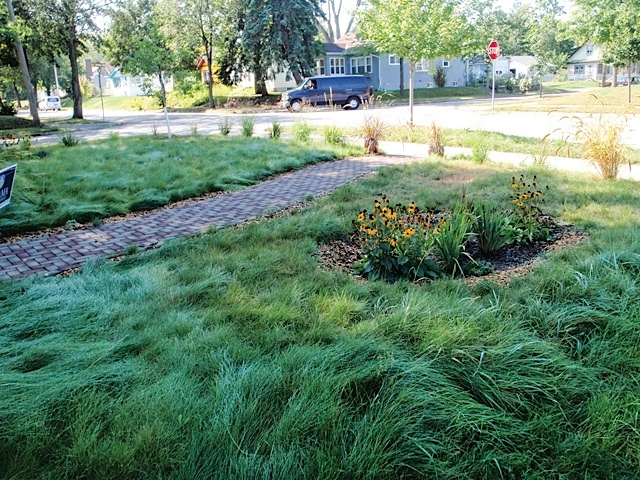 While this project was completed several years ago, the lawn incorporates several sustainable practices that are now becoming more popular in the Twin Cities area, such as planting alternative grasses like fescue, and using rain barrels and rain gardens to consume water in a more conscious way. The yard has a unique and natural aesthetic that my wife and I deeply appreciate, but we were a bit wary of the alternative maintenance required. Contrary to our assumptions, our new sustainable yard does not require a significant amount of expert maintenance, a trait that appeals to many homeowners looking for sustainable options. Aside from all the environmental benefits of sustainable landscaping, Zaayer notes that the lower amount of maintenance is a strong selling point for homeowners. 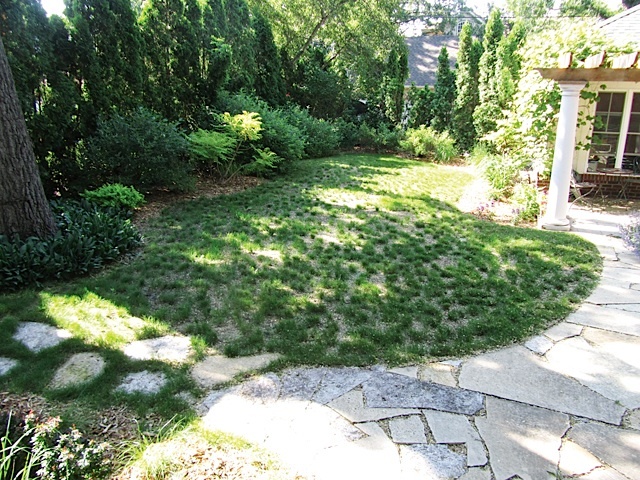 One increasingly popular way to achieve a green yard without much input is to use no-mow fescue grasses. Fescue is a clump grass that does not require special watering or more than an annual mowing in the fall, making it a great choice for sustainable yards. 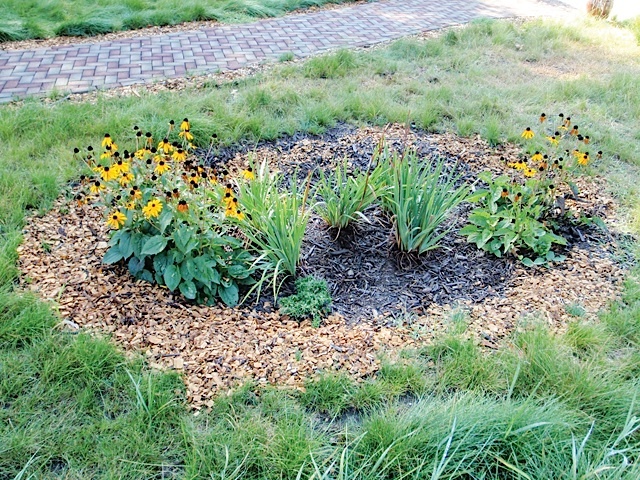 An Attractive and efficient Rain Garden. Unlike traditional bluegrass, fescue has a much more natural aesthetic. Zaayer explains how fescue’s seeding cycle creates several different visual looks throughout the season: “When it goes to seed, it stands up. But once it’s done seeding, it flops over and lies down on its own weight.” When the fescue is lying down, it looks lush and wavy, and it covers up any bare spots between each individual clump. Although fescue is still more of a “niche” planting choice, more people are choosing to enjoy this low-maintenance grass, though a different type of upkeep is required: occasional weeding. Though weeding may sound like tedious work, Zaayer notes that many people find it enjoyable. He describes the appeal one client saw of weeding: “He wanted to sit outside with his wife and have a conversation as they tended the lawn instead of putting on headphones and running an 80-decibel lawn mower.” The act of weeding can also be therapeutic or meditative, offering a quiet task that connects people more closely with their yards. Fescue is a wise choice for people who have busy lives, especially if they frequently travel. For one of Zaayer’s clients, a key factor in choosing a fescue lawn was his lifestyle: “He travels a lot, he works a lot. He’d be gone for weeks at a time, so having a traditional lawn that you mow on a weekly basis wasn’t right.” Zaayer adds that many sustainable landscaping options, such as fescue, can thrive on a hands-off approach, making them ideal solutions for busy lifestyles. The cost of no-mow fescue seed can be slightly higher than the traditional bluegrass seed mix used on many Minnesota lawns, creating a higher upfront cost. In the long run, however, fescue is proving to be an option that is worth the initial investment. Water bills for these yards are significantly lower, and frequent costs such as gasoline for the mower are few. And most of all, a homeowner does not spend their precious time laboriously pushing a lawn mower around every square foot of the yard, week after week, year after year. In addition to choosing sustainable grasses, homeowners are more frequently incorporating rain gardens into landscape designs in order to minimize the impact on the city’s sewer system. Rain gardens contain loose soil and plants that enjoy water, such as Dwarf Bush Honeysuckle. They are great for capturing any excess water from downspouts, and they can also come in handy during extremely heavy rains by absorbing any additional water that backs up from the storm sewer. Zaayer also notes some additional benefits: “When water filters through rain gardens, its temperature cools and some of its energy is removed,” making its impact on the sewer system significantly lighter. In addition to more macro-level choices such as grass seeding and water systems, there are many fun sustainable choices that are purely decorative. For example, taller ornamental grasses like switch grass can be planted along property lines to create a low-maintenance pseudo-hedge for privacy. Or, people can create outdoor living spaces using AZEK permeable pavers, a LEED-certified alternative to brick or stone pavers. 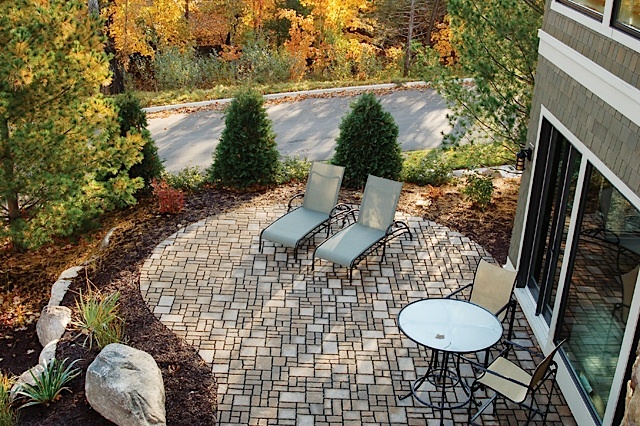 Made of 95% recycled materials (like old tires), these slip-resistant pavers look like traditional stone, reduce water run off, and have an extremely long lifetime. Unlike our yard, which was designed to be completely sustainable, there are ways to incorporate thoughtful practices without committing to a total landscape overhaul. In fact, many of Southview Design’s clients choose to add options like rain gardens into their current designs. Many people choose to make these small, conscious changes because they help the environment without requiring drastic changes to the yard’s aesthetic. If people are interested in sustainable landscaping, Zaayer suggests testing the changes out on a portion of the yard. An easy way to do this is to turn unused areas into sections that are more passively managed, such as a no-mow fescue area or a wildflower planting. “That’s a really great way to test the waters and see if you like the aesthetic,” he adds. “People may like the aesthetic but not want it everywhere.” Even these small, thoughtfully designed sections can reduce the amount of resources and time required for maintenance. When choosing an area to redesign, Zaayer suggests that people consider areas that are not directly situated around the house: “The community standard is usually a house with plantings around foundation, which is great when you’re walking down the street or driving by. It makes the house look really nice…but when you’re inside the house, what do you look at?” Creating areas a distance away from the house will allow you to enjoy the view from your own window. No matter what stage of the design process clients may be in, Southview Design can help people redesign their spaces to incorporate sustainable choices. Some of Southview Design’s clients come to them with specific goals, such as reusing water from the roof or minimizing spaces that require mowing. Zaayer also says many people start the process simply with photos that inspire them or have elements they like. Throughout the design and planting process, Southview Design helps homeowners make smart choices that have lasting impact. Because the look of a sustainable yard can conflict with traditional expectations, people may initially think that the yard doesn’t adhere to community yard standards. In order to avoid some of the misunderstandings and educate the public about sustainable yards, many homeowners put up signs that label the yard as a sustainably designed space and list websites that provide more information. Admittedly, the aesthetic is different from what people have come to expect from their lush, perfectly trimmed yards. But many people are finding that challenging these expectations by using more sustainable choices is worth it, both for the homeowner and the environment. To learn more about sustainable garden options, visit www.southviewdesign.com.